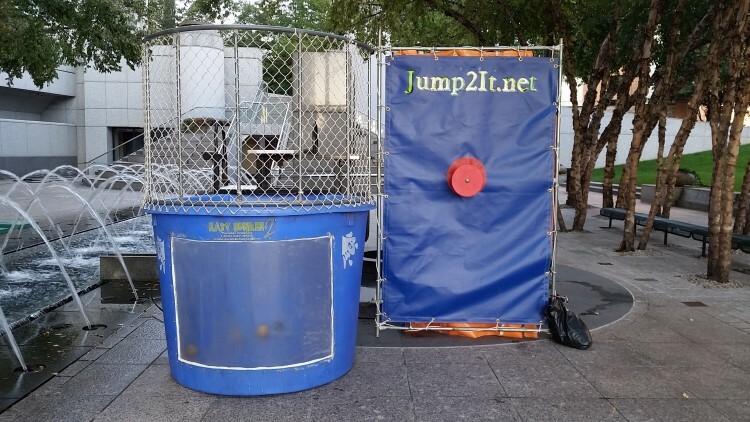 A dunk tank which is also commonly known as a dunking machine or a dunking booth is one of the major attractions used in parties and church, school and business events. The dunk tanks comes with a 550 gallon water tank where a person is made to sit on a collapsing seat. 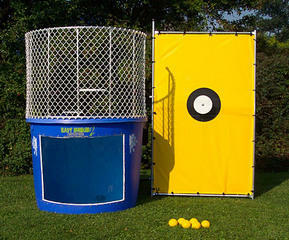 During the game you need to throw a ball at a target, which when hit makes the seat collapse thereby dunking the person into the dunk tank filled water. You can choose to dunk the teacher/boss or any other eminent local personality to have a real fun and entertaining show. 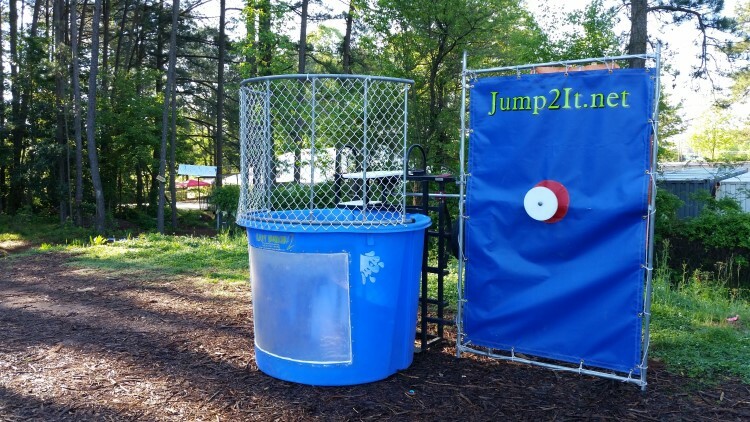 So create a splash at your next social gathering in Newnan or Peachtree City by getting a dunk tank rental from jump2itpartyrentals.com. Our dunk tanks come with a plastic tank, a seat, a metal supporting frame, target and balls. The volunteer or the victim is supposed to climb the ladder to reach the seat hanging over the tank. The fencing around the seat would prevent the volunteer from being injured by stray balls which don’t hit the target. Choose the person who would be seated on the dunk tank and watch them get soaked every time that the ball hits the target. Some of the most popular dunk tank victims include the boss of your company, teachers, beauty queens, community leaders and other preeminent local personalities. Renting a dunk tank will make it the focus of your evening’s entertainment and all your guests regardless of age are going to have a great time. Fundraisers: Dunk tanks can be a fun way of raising funds. The participants can pay a small fee for a chance to throw the volunteer into the water or even a large fee to just walk up and press the target! Private parties, picnics, carnivals, summer parties: You can rent a dunk tank from us for your next private party at your house. They make for great entertainment and all you need to do is find a willing volunteer who is ready to get dunked. 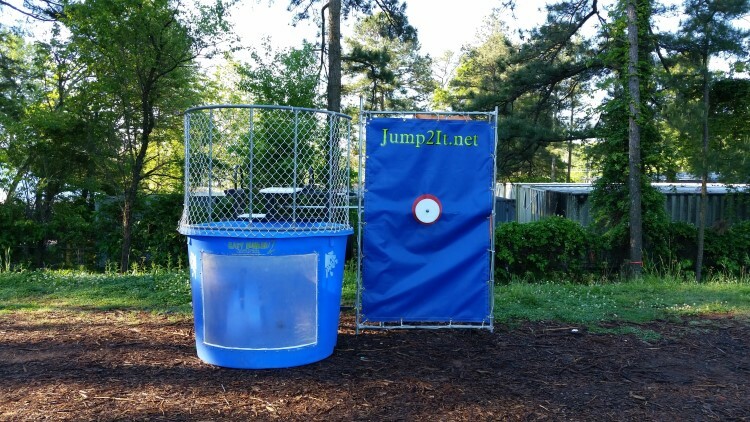 No matter if you are planning a birthday bash, a school picnic, block party or church event you can always add some extra fun to your gathering by renting a dunk tank. Night clubs and bars are also known to rent dunk tanks for promotional reasons. A dunk tank in any social event is sure to bring out the child in you. This super exciting activity is enjoyed by people of all ages which is why it is one of the most popular item at any big gathering. Jump 2 It Party Rentals with its office near Atlanta rents out dunk tanks in the following areas: Tyrone, Jonesboro, Palmetto, Union City, Brooks, Newnan, Peachtree City, Senoia, Riverdale, Fayetteville, Sharpsburg and the rest of the Atlanta metro area. If you are a resident of one of these cities who is looking forward to having a great bash on your next big event just contact us.